Sunway Group started construction of its RM400 million Sunway Medical Centre in Seberang Jaya today as part of the group’s RM1 billion healthcare expansion plans. The hospital, with expected completion in the fourth quarter of 2020, will have a capacity of 180 beds in the first phase. It is one of the five hospitals under the Sunway Group’s RM1 billion healthcare expansion plans in Malaysia. “Seberang Perai is growing rapidly as one of the most populated districts on the mainland with its population estimated to surpass 1.1 million in 2020,” Sunway Group founder and chairman Tan Sri Jeffrey Cheah said. He said the medical centre will support the Penang state government’s Vision 2030 to deliver quality healthcare and increase state revenue from medical tourism. “The Sunway Medical Centre Seberang Jaya will prepare Seberang Jaya to be a catalyst for Penang’s sustainable progress,” he said after the groundbreaking ceremony of the hospital at Seberang Jaya here. The medical centre is Sunway Group’s first hospital in Penang and is part of the expansion plans of Sunway City Seberang Jaya. Sunway City Seberang Jaya includes Sunway Hotel, three phases of commercial developments, a business park and Sunway Carnival Mall which is also being expanded. Cheah said the mall will be expanded from its current 500,000 sq ft to one million sq ft by the fourth quarter of 2020. Penang Chief Minister Chow Kon Yeow, who officiated the groundbreaking ceremony, said the tertiary hospitals driving medical tourism are mainly on the island. 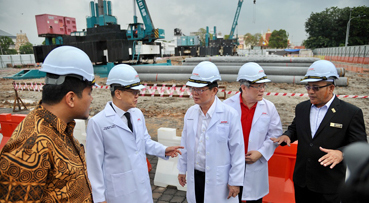 “I am glad that Sunway Group has decided to build a tertiary scale hospital on the mainland which has the capability of attracting medical tourists to this part of the state,” he said. Chow said there are a lot of economic investment industries on the mainland now so having a good healthcare set-up here will be welcomed by local residents.